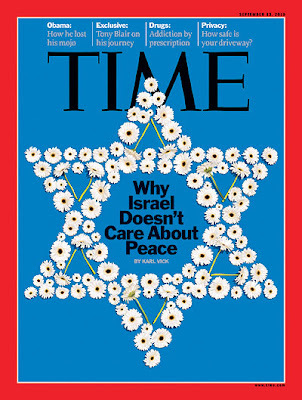 When Time Magazine carried an article on “Why Israel Doesn’t Care about Peace“, a whole coterie of American Zionist supporters reacted as if Time had become anti-Semitic. For any writer to cast the slightest aspersion on Israel’s claim to wish for peace is tantamount to alleging that there never was a Sermon on the Mount. Time’s cover and story on life in Israel prompted more than 1,000 letters, mostly in protest. Several of those letters allege the usual canard that the article is anti-Semitic. They berated Vick for lacking reliable support for his claim. However, they ignored a journalist with impeccable credentials who writes for the influential daily journal Ha’aretz. Both the Israelis and the American Zionists have been lying and brainwashing others for so long they believe the propaganda themselves. If there’s any sincerity in the minds of those who say that Israel wants peace, they need to stop believing that Israel can do no wrong. Israel needs to stop being a propaganda machine refusing to accept criticism and failing to indulge in self-criticism. * Paul J. Balles is a retired American university professor and freelance writer who has lived in the Middle East for many years. For more information, see http://www.pballes.com. “In our Qur’an it is written that everyone of us has two angels on his shoulders. On the right, angel Atid registers all our good actions. On the left, angel Raqib registers all our sins and bad actions. On Judgment Day, angel Esrafil will ask us to stand up in front of God and the books will be read. We the Palestinian people keep a book like the two angels for all the countries and all the men. We will never close the books till the day will come for their Judgment. They will have to respond to all the crimes and atrocities committed against our nation, since more than a century.” Mohammad, Gaza. When, in June 1967, Israel captured the Gaza Strip, the West Bank including Jerusalem and the Golan Heights, the then Israeli Minister of Defense Moshe Dayan declared it would be an enlighted occupation. And, indeed, since 33 years now the occupied experience day in, day out the enlighted occupation. In 2006 there was a priest in Gaza with a heart, Father Manuel Musallam from Bir Zeit, West Bank. Father Manuel was the Voice of Gaza and his voice was the voice of a tenor till he retired in April 2009. Since then, incidentally, the Catholic church of Gaza only prays and the Greek-Orthodox and the Baptist churches continue only to pray like in the past. At the beginning of August 2006 Father Manuel took us for a tour: Muslims and Christians, political people, deputies, activists, journalists, nuns, Caritas and other Ngo’s, ordinary citizens. We went, in particular, to Beit Lahia in the north and to El-Maghazi RC in the central Gaza Strip to express solidarity to victims of the latest devastating military operations. On our way back to Gaza City a very young man from El-Maghazi RC spoke to me on the bus. He was working with Caritas-Gaza. His job was to provide wheelchairs, walkers and crutches to the disabled. He invited me to go to Esh-Shifa hospital to meet the crippled he worked with. I was busy but he insisted: “You should come! You should see!” I was very busy. He continued to insist and repeated: “Please, you should come! You should see!”. We went to Esh-Shifa hospital. It was in the afternoon. In the first room we entered there was Emad Eid Mattar Marzuq. Emad had lost his two legs at the end of July, a few days before my visit. His wife was pregnant at home. His brothers were with him. They offered me tea, coffee, soft drink, fruits, candies, as it is the Palestinian custom. It was a hot day. Emad was 37-year old and handsome. A white sheet covered part of his body. When Emad moved I saw for a second that he was completely naked and his two short stumps were enormous due to big bandages. The bandages were so big that no underpants could be worn by Emad. One night Emad was walking in the neighborhood of Shejayia in Gaza City. While he was speaking on his cell phone a missile was fired at him. His brothers explained me that inside such kind of missile there are some sort of turning knives which cut everything. The young man from Caritas took me to other rooms. That day I saw no less than twenty amputees, a living catalogue of horror. All of them were young. They had been hit in the areas of the latest Israeli incursions or in another places. One was without his right arm and without his left leg. One was without his right eye and without his left leg. One had his leg cut under the knee, another one had lost his entire leg. One had lost his right hand and his left arm, another one had lost his two legs. However, Emad was the worst case that day. I promised Emad Marzuq to return to visit him in a couple of days, but I never returned to the hospital. From the late director of Caritas I got a photo of Emad. Towards October I heard Emad interviewed by the then BBC correspondent Alan Johnston for the English World Service. I got his news through one of his brothers and some acquaintances. I was informed Emad went to Iran to get artificial legs. Later I was told he couldn’t walk with such legs. Then I heard Emad got an electrical chair, called here “car”… and then the electrical chair broke and Emad returned to use his wheelchair. In 2008 I had a conversation with a foreign man from a democratic country who used to come regularly to Gaza to gather – as he said – the feelings of the Palestinians (sic). When I showed him the picture of Emad, he said: “It was in 2006 when Israel introduced this kind of missiles. I went to Esh-Shifa hospital at the time and I saw beheaded bodies and bodies cut in two. And when they were transported on a stretcher, sometimes half of the bodies fell on the ground.” How did you feel after that? Could you sleep at night? I asked him. He replied: “I felt nothing because this is not my war, although I have Palestinian friends. Maybe tomorrow I will be in Congo or in Somalia!’ And he explained me the connection between the missile, the communication system, the cell phone and the target. According to him, it was not necessary to have spies on the ground. In May 2009, after the war, I had the courage to visit Emad at home, in Et-Tuffah district in Gaza City. The zinc roof of his room was holed. He was jumping from his wheelchair to his bed and vice versa. The two legs from Iran were in a corner of the room. The two legs were rose-coloured. Each one weighted six kilos. The stumps of Emad being short and weak, he couldn’t raise his legs once he wore the artificial limbs. Further, the prosthesis were injuring the skin of his stumps making him bleeding. And, moreover, the legs were rigid like two trunks, they were not moving at the knee and at the ankle. The two legs from Iran in a corner of the room were adding insult to injury. Emad also complained about his electric chair which was not working properly. And he added that in thousands they came to visit him, Ngo’s, journalists, all kind of people, with cameras, video cameras. They made promises but he had never seen a cup of tea. The day I visited Emad I was with a professional local crock (crook ? ), but at the time I had no evidence yet that the crock was a crock. Just I had heard. The crock promised to Emad a new electrical chair and to others crippled the crock made the same promise. No one got the 4,000 dollars electrical chair and, fortunately, the government stopped the altruism of the crock. I visited Emad the other day. Before, a few meters in front of his home, on the other side of a quiet and sandy street, there was a wall of greenery with climbing flowered plants. Behind the green wall there was a large track of land – called here “bayara’ – full of citrus and olive trees, and there was an agricultural well. Now, in front of the house one can see a sort of airport, a piece of Sahara. Eight months ago or so, after midnight, the Israeli air force bombarded the well and left a large and deep hole. The zinc roof of Emad’s house flew. The morning after Emad recorded on his mobile phone the devastated land, where all the people gathered, and the hole. Like every Gazan, Emad is an amateur war reporter and he showed me his shooting on his mobile. At present, Emad has a new zinc roof on his one-storey house. The house is modest but tidy, with very clean paint coats. Now Emad, 41, who was a laborer, has a new nine-month baby, in addition to his four children aged from 16 to 3. Some months ago he has got a new wheelchair from an international Ngo which bears the trademark of an Israeli company… and the electric chair is under repair. Despite their daily dose of drama, most of the Gazans who see the picture of Emad are horrified, even amputees. The picture was taken by Caritas-Gaza in the house of an Emad’s uncle. Emad was lying on a mattress on the floor after the double amputation, without an adequate bed. In the streets of Gaza one can see many amputees. There are scores of girls, women and men like Emad Marzuq and many are even in worse physical conditions and poorer than Emad… and not all of them can go in the street. My friend Abu Ramzi underlines that the smart Israeli missiles are American. – Flora Nicoletta is an independent French journalist living in Gaza. She is currently working on her fourth book on the Palestinian question. Listen to the hasbarite lies ! On October 20 2010, two IDF soldiers came to the University of Michigan campus as part of a national PR campaign by Stand With Us aimed at justifying Israel’s recent atrocities in the Middle East. Students, staff, and community members collectively engaged in a silent walk-out in memory and in solidarity with all of the silenced Palestinian children that were killed by the IDF during Israel’s most recent offensive on the Gaza Strip who are unable to take a stand and give their account today. After a third trip to Ofer military compound near Ramallah on October 18, 2010, and much expenses in terms of time and money, I am pleased to report that my trial based on manufactured charges by Israeli police was dismissed by the military judge. It was partially observed by Tamar and Aya, Israeli women of conscience who report regularly from the West Bank (see http://www.mahsanmilim.com/ . It was a manufactured “traffic violation” but in reality it was for “driving while being Palestinian” and even though both the policewoman and the prosecutor both lied and tried to twist the facts, the judge was decent enough to see through this. Unfortunately, upon arriving home, I found a delivered registered letter (my mother signed for it) that says that the Israeli police have now “evidence” and have sent a file to the prosecutor to charge me with new “security offenses” based on a military rule enacted in the occupied areas in 1982. They did not specify the offenses in the letter but gave me 30 days to respond to them in writing. The letter was in Hebrew and dated October 3, 2010 but mailed on October 6, 2010 and received October 18, 2010. This gives me and my lawyer little time to find out what the (trumped-up) “security” charges are and respond to them! This is obscene injustice but if the authorities think that this endless harassment helps in anyway to achieve their goals (whatever those may be), then they miscalculated and will sadly be disappointed! We will keep you informed. Under a most extremist government in Israel’s 62 year history, the extent of the absurdities here have accelerated to become almost unbelievable. From attacking humanitarian ships in International waters, to laws to strip Israelis of their citizenship, to laws to demand loyalty by non-Jews to a Jewish state (imagine if South Africa under apartheid demanded loyalty to the white government), to laws to punish peaceful protesters (Abdullah Abu Rahma sentenced to one year under the charge of “incitement” for merely engaging in nonviolent protests in Bil’in), to laws to allow criminal prosecution of those who call for boycotts, to arresting children hit by a colonial settler car while driving in the children’s neighborhood that the settler is trying to take over*, and the list goes on. My study of history tells me that Israeli governments engaged in such irrational behavior the year before every major uprising in the past 62 years. One is tempted to accept the notion that “what we learn from history is that we (humans) learn nothing from history”. But we must maintain our faith in humanity and that maybe, just maybe, there are still enough rational people of all faiths and persuasions to salvage this (un)Holy Land from total descent into fascism and self-destruction.